After two days of looking around ski shops I finally bought a new pair of skis on Friday afternoon. 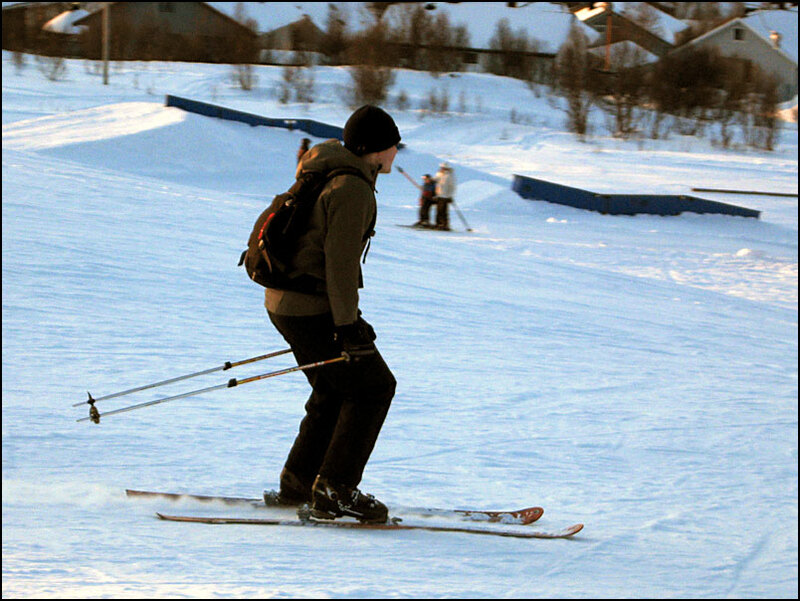 Shortly after we arrived in Norway, we bought fjellskis, which are good for skiing up gentle slopes but are less good for going up steeper or icy slopes. The skis I bought on Friday are more suitable for that kind of thing, and behave like downhill (“real”) skis on the way down. It was hard to choose between heavy skis (good for going down) and light skis (easy to go up), but I finally decided on a pair of Völkl Snow Eagle skis with really light Dynafit bindings. 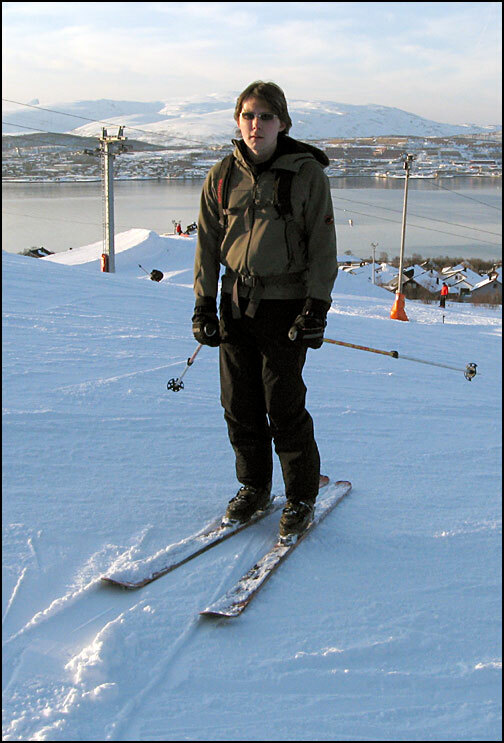 Today I went to a small local ski slope (Tromsø Alpinsenter) to get used to them before trying them in the wilds 😉 I was a bit worried that the fat skis (good for powder) would be difficult to use on piste, but actually they were just as easy to use as downhill skis. Hanneke came as well and rented some skis from the centre. The centre is quite small, just three anchor lifts, the highest of which goes up to 600m. 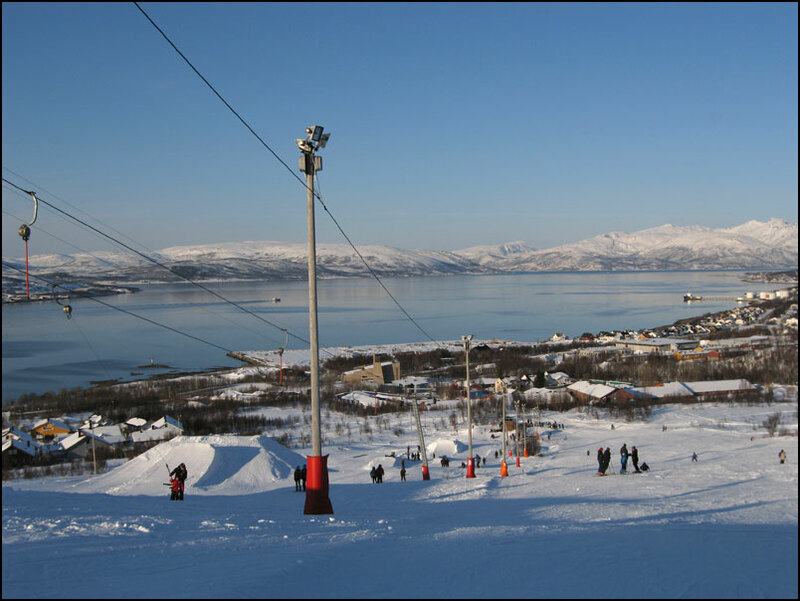 However, you can ski right back down to sea level, the views are fantastic and there are no queues! The last time either of us did any downhill skiing was more than two years ago, and in the mean time we did a lot of cross-country skiing, so it took a while to readjust to alpine skiing. The first run was much more scary than it ought to have been! We went straight to the top of quite a steep run, as we used to be able to ski down a slope like that quite happily, but it took a while to regain faith in the control you have over downhill skis compared to our cross-country skis. 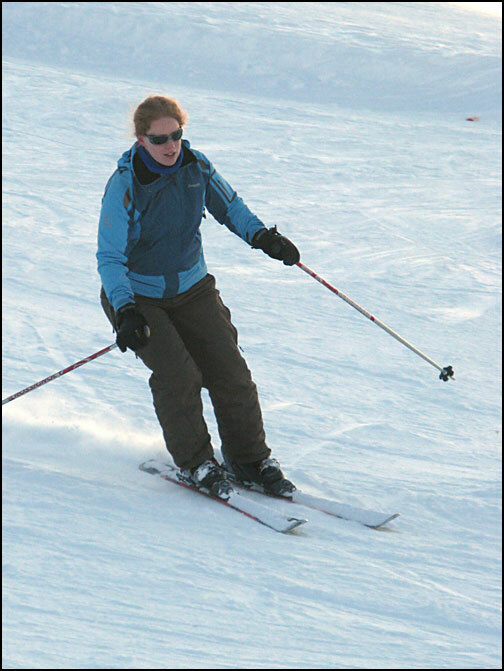 Hanneke was nearly ready to give up downhill skiing forever after the first slope! Below is a panorama from the top of the 600m lift. This picture is all Hanneke has seen of this view, as she spent all day on the kiddie slope trying to get comfortable again.